Heart Healthy Soups Warm Your Soul! When the weather is cold outside, nothing warms the heart more than a bowl of soup! It’s so comforting and soothing to the soul. But many canned soups are high in sodium and ordering them out at a restaurant can be high in fat and calories. Making soup at home can be easy and delicious and also very good for you when it contains lots of vegetables and broth! Another great thing about making a big pot of soup is the leftovers! When we make soup, we often have enough for three and four meals for the week! Most of us eat with our eyes so making a meal that includes lots of colors can be one way to keep it extra appealing! It can also contain additional nutrients. Many of us are on the look out for healthy menu ideas. One soup that my family and I love this time of year is this soup! I hope that you enjoy eating it as much as we do! 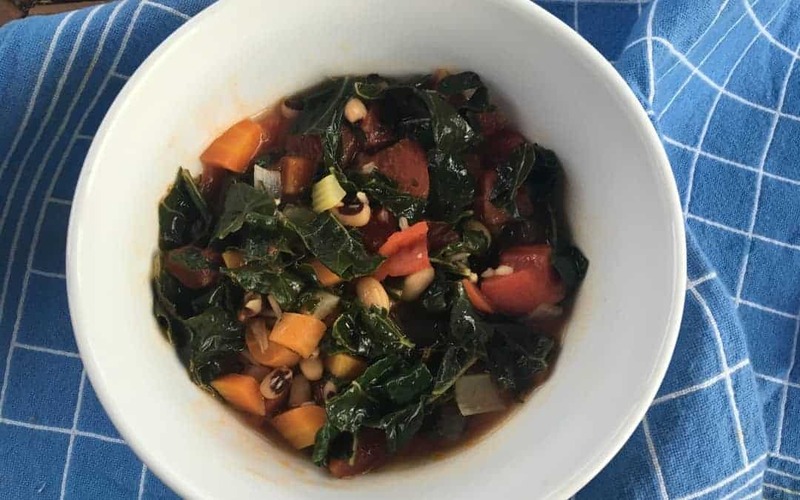 Not only is this soup vibrant looking and tasty but it is full of healthy benefits including vitamin A, vitamin C, potassium, phytonutrients and a vegetarian source of protein from the beans. It is also low in calories and very fiilling. The barley contains a beneficial soluble fiber called beta glucan which can be helpful lowering blood sugar and cholesterol. 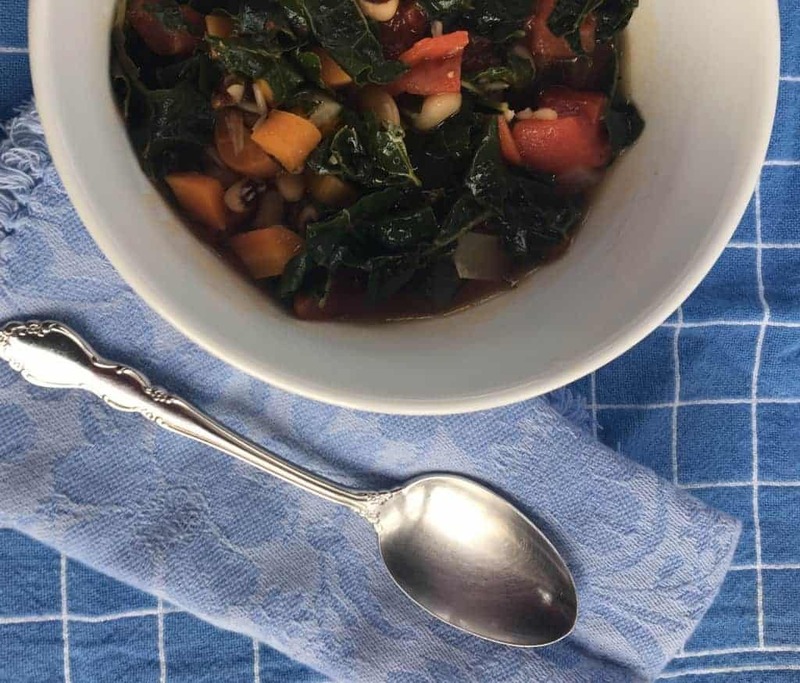 This simple and tasty soup makes the best of plant based cooking when all of the ingredients come together! Greens often are a local food in the winter and home canned tomatoes can be used. Dried beans may also be available locally where we live. Makes 4-6 servings. If you live in the Asheville area, check out some of the winter, local farmers’ markets here. Heat olive oil over medium heat in a large pot and add onion, carrot and celery. Cook until vegetables are tender. Add garlic and cook a few seconds. Add tomatoes, thyme, bay leaf, salt and pepper. Add kale and let soften. Adjust seasonings if needed. Serve in bowls and sprinkle with Parmesan cheese and serve with crusty bread to complete your meal. Instead of canned beans you can cook dried beans and save some sodium. Being a registered dietitian nutritionist in Asheville, I love the variety of local food that we have at our area farmers’ markets. I also love to cook and help my clients live healthy food recipes. I like to plan my meals using a seasonal approach. Planning meals can be a more nutritious way to eat and can also save money and time. I also have a lot of tasty recipes on my blog and recipe section on the Vine Ripe Nutrition website. You can read more about me and some of the services that I offer here. What is your favorite soup? I would love to hear about it! All you need is a little crusty bread to complete this meal!